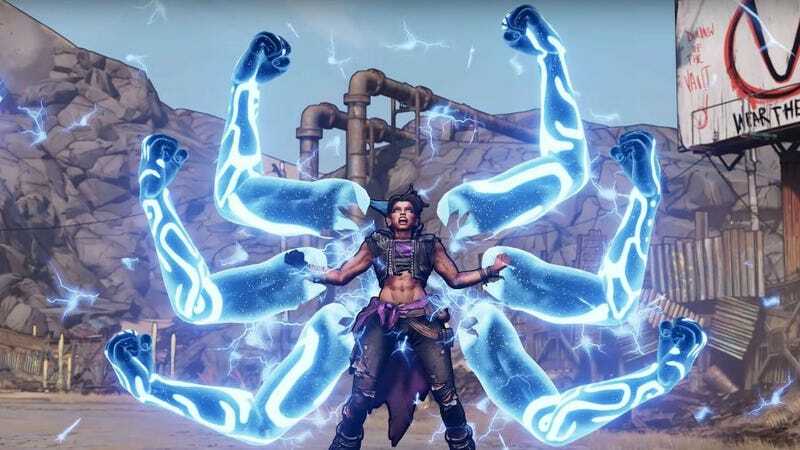 Yesterday, Gearbox announced that Borderlands 3 will be an Epic Games Store exclusive for six months after its September 13 release. Like clockwork, Steam users began review bombing previous games in the noted dabbing robot shooter series shortly after. Twenty-four hours and thousands of negative reviews later, Steam’s new anti-review bomb system has yet to defuse the problem. And then there’s one that’s just two middle fingers with the words “Epic Store” between them. There are also a handful of positive reviews near the top that still express anti-Epic sentiment. Currently, it’s impossible to say whether or not Valve has reached out to Gearbox, but the company has yet to make any marks or remove these clearly trolling reviews from Borderlands games’ scores. Kotaku reached out to Valve and Gearbox for more information, but hasn’t heard back. It’s worth noting that these review bombs aren’t blowing up Borderlands so much as they are pinging harmlessly off its cel-shaded shell (which is probably made of guns). The Borderlands games are triple-A hits with tails so long that they circle the dang planet, ensnaring millions of players to this day. Despite review bombs, interest in the series appears to be on the rise, with Borderlands 2 peaking at over 40,000 concurrent players on Steam today, putting it in the platform’s top ten most-played games. The Handsome Collection is also currently a Steam top seller. This is likely due to a number of factors, from Borderlands 3's recent reveal to the new texture packs and discounts promoting them. Other games, however, could still be susceptible to review bomb tactics if lag time becomes a standard part of the new anti-review-bomb system. That could mean lost sales that developers don’t get back even after their games’ review scores are wiped squeaky clean, not to mention lasting negative sentiment in the Steam community. It’s good to see Valve relying more on human teams to handle moderation issues, but the failure to act quickly could be a potential downside of that. On the other hand, it could just mean the company is still working out some kinks in a new system. Here’s hoping it’s the latter. Update - 7:30 PM, 4/5/19: Two days after the review bombs began, Valve’s new anti-review bomb system has kicked in. On Borderlands 2's review graph, the period of time spanning from April 3 to today has been marked with an asterisk that denotes “off-topic review activity.” The game’s recent and overall review scores also have asterisks next to them and have been reverted to their pre-April 3 percentages of 90 percent positive and 96 percent positive, respectively. Borderlands: The Pre-Sequel and Borderlands: Game Of The Year Edition have received similar treatments. That said, the most-upvoted anti-Epic-Store reviews are still visible, plain as day, on the game’s store pages. So review bombs might not hurt games’ scores in the long run anymore, but they’re still definitely effective.